A few months ago it was my 30th birthday. 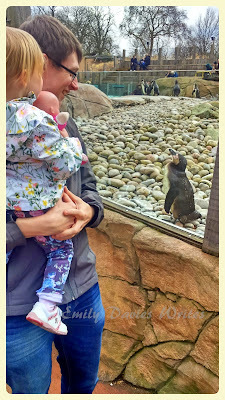 Now I know most 30 year olds would be out in a posh wine bar celebrating to the early hours, but seeing as a week later it's Ruby's birthday, we decided to combine our treats and spend a few days in London - with the highlight being a trip to London Zoo! Despite having grown up in the South East and having lived in London throughout my 20s, I had never in my memory made a trip to the zoo, so I was particularly excited! We had got the train up the previous day and were staying in a hotel in Acton. Ruby is a natural when it comes to public transport and she wasn't perturbed by the underground at all, rather she quite enjoyed charming all her fellow travellers from her buggy! Now, before we get to the zoo part, I did just want to share a travelling hack with you. You know when you have to check out of your hotel at 11am but you're going out for the day and don't want to lug your suitcase around with you? Well head over to the Excess Baggage Company. We travel out of St. Pancras Station to get home, which is luckily quite near to the Zoo so we stopped there first, dropped off our bag before heading off on our luggage-free way. You pay about £10 for 24 hours and it is well worth it to not be lugging a suitcase round the zoo with you! Anyway, onto the zoo! We got off at Camden tube and walked down, it's really clearly signposted and not that far - maybe 15-20 minutes. I think our other option would have been to walk from St. Pancras through Regent's Park - there's probably not much in it as we were at St. Pancras anyway. We went on a Tuesday during term time so the zoo itself was not that busy. Aside from a few school trips and the odd tourist there weren't many people around so it made for a really pleasant day with Ruby. We got her out the buggy on arrival and she trooped around for most of the day on foot which made it so much more enjoyable because you felt like she was experiencing it all. The weather was quite changeable so we started off sheltering from a shower in the Aquarium. I thought Ruby would enjoy all the lights and bubbles and different coloured fish floating about but she marched past every tank shouting "Fish!.... more fish!.... more fish!...." so I'm not sure she was particularly enamoured by all the different varieties, but we thought they were pretty cool to see! We had a leaflet which told us when all the feeding times were so we planned our day around that, prioritising the tigers, penguins and giraffes. After stopping for a picnic lunch on a bench we visited the Gorilla Kingdom and then the tiger enclosure for feeding time. The staff appeared really knowledgeable and covered everything you would want to know about tigers, and those tigers specifically. It was really interesting. We got there just early enough to grab a spot by the glass so we could see, but if you're caught out and it's busy you might find that you can't see as much, despite there being plenty of different viewing spots. The zoo is big enough for you to feel like you're getting your money's worth but not so big that it's overwhelming or exhausting, even for a two year old. It's very buggy friendly with most of it being on ground level or with ramps. Ruby walked around most of it and loved it! 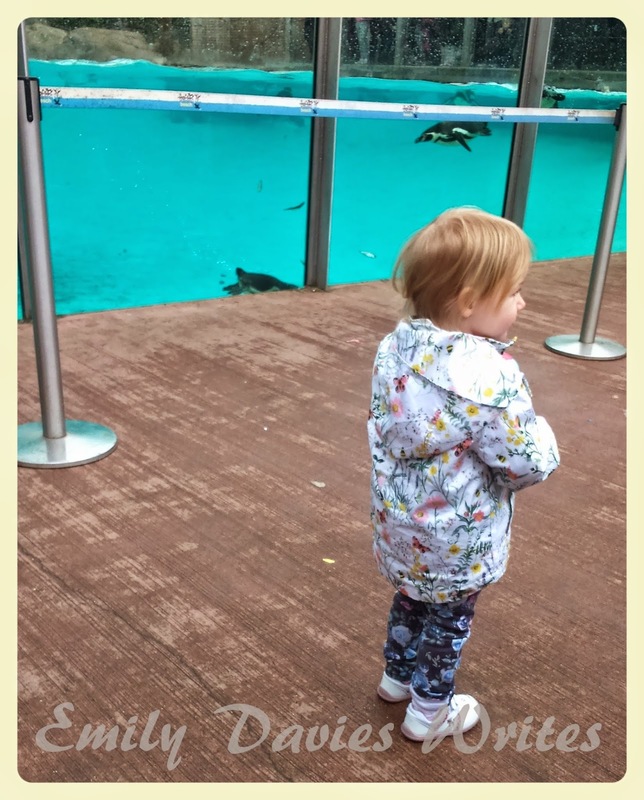 A highlight for us were the penguins! 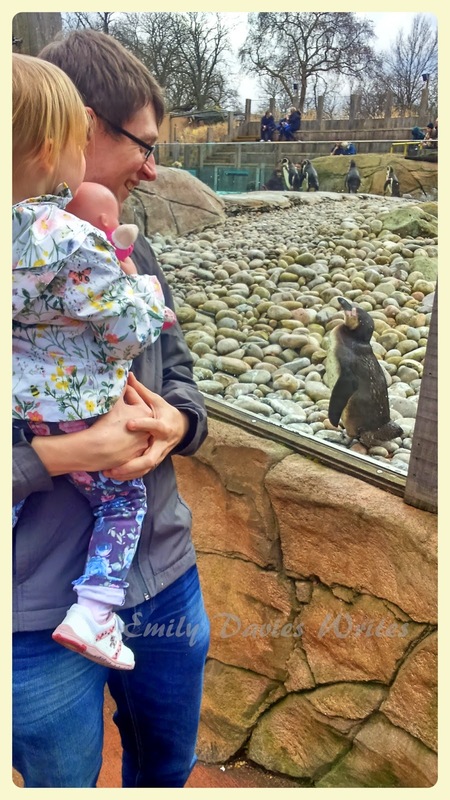 (If you read my Aquarium post, you'll know we're big penguin fans!). We got there for feeding time and it didn't disappoint. We bagged ourselves front row seats. 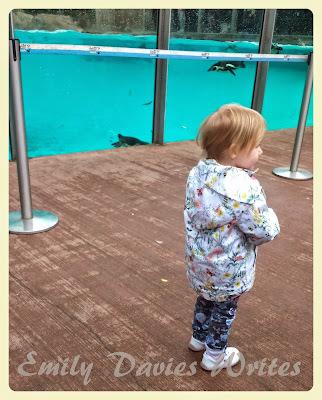 Ruby loved watching them jump and dive and swim and again, the talk was entertaining and informative. It's popular though - so get there early for a seat! 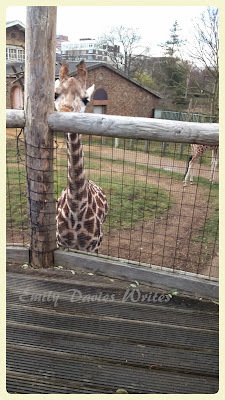 We also love giraffes so visiting them was a must! We had arrived in time for what we thought was feeding time but it didn't happen and there wasn't anyone else there so maybe we were mistaken! There's a viewing platform so you can see them at their height and they're quite inquisitive so if they do venture out of their house (the weather meant we caught them at the right time) they do come right up to the platform. I'm not quite sure Ruby knew what to make of these strange animals but she seemed to like it. 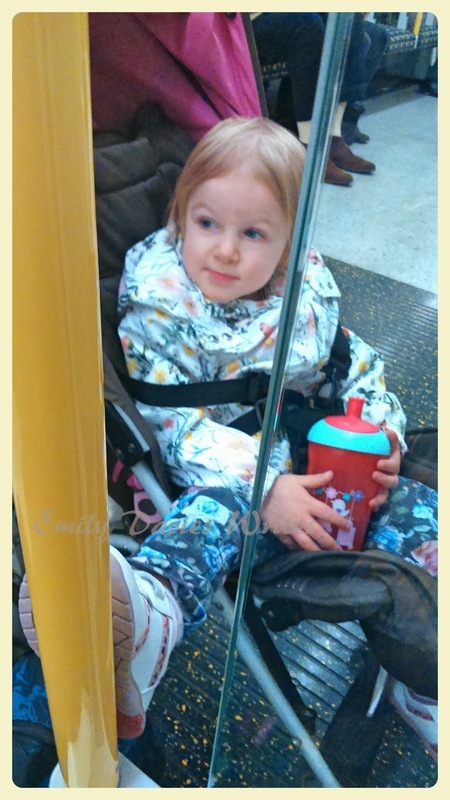 When Ruby was tired we put her in the buggy and took her to the butterfly enclosure which was a big hit! I'm not normally enamoured by nature too much but this turned out to be one of my favourite places - they're just so beautiful and delicate! One disappointment was that you're not allowed to take buggies into the monkey enclosure because the monkeys roam free and will jump on them which can be frightening for the children. I understand the reasoning but we had literally just put Ruby in the buggy in the hope that she might sleep so we gave that part a miss (you can take your child out and leave the buggy outside, you'd just have to go back on yourself to fetch it!). We also would have liked to have seen some lions but they're on holiday until 2016 because their enclosure is being re-built. All in all, it was a fantastic day, despite the weather being changeable and being caught in a massive hail storm (there's enough indoor stuff to make it ok, but it probably wouldn't be enjoyable if it rained constantly). We left with a toy penguin from the gift shop to remind us of our fun, it was about £6 which I think is pretty decent. I can only apologise for the lack of photographs, however, we were just too busy having fun! Transport: 15 minute walk from Camden Town station (Northern Line). Cost: Standard adult tickets are £24.30 at the gate without a donation, but you can save 10% by booking online in advance. If, however, you're travelling by National Rail on the day then be sure to take advantage of this 2for1 offer. I do, however think that it's well worth the full price. Under threes go free and children are £17.10. Time: This is a full day trip if you want it to be. There's plenty to see and do and you can easily spend a good six hours or so walking round. Food & Drink: We kept costs down by taking in a picnic lunch and eating it on a bench which was perfectly fine. However, there is a brilliant canteen style restaurant with lots of different types of food on offer. It's big but not huge so I can imagine it gets pretty busy during peak time, but if you're lucky to catch it on a quiet moment then it's a lovely place to sit and eat. We did buy lattes from one of the kiosks which are dotted about the place - they do serve soya milk (a must!) and they were reasonably priced (£2.80 ish?). Afterwards: If you want to head out for dinner after your trip then there's plenty of bars and restaurants up Camden way, including your family favourites like Nandos. Alternatively head down to the West End - a short bus or tube ride away where there's plenty of places to eat on offer.